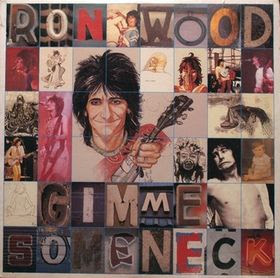 A year after releasing the acclaimed Some Girls, in 1979, just a few years after joining the Rolling Stones, guitarist Ronnie Wood released his third solo album, Gimme Some Neck. With the release of his latest solo offering found the footing he needed to show he can do it all on his own. Wood, who started out in The Faces, was one of England's best blues guitarists and in 1975, he replaced Mick Taylor in the Stones and fit right in. Maybe it was because of the confidence he got from playing with Mick and Keef, his third solo offering arrived and became his best work on his own. Much of the record is actually a Stones record with him fronting the band as Charlie Watts provided drums on most of the album, Keith Richards helped with rhythm guitar, and Mick Jagger sang backing vocals, as well as Bobby Keys playing sax. Gimme Some Neck spent 13 weeks on the Billboard charts and Wood proved to the music world that he could do it on his own --- with a little help of his friends. With the solo record and tour under his belt, which he brought Richards out for as part of his backing band, Wood and the Stones would then return to record Emotional Rescue which was released a year later. Gimme Some Neck proved to be the solo spark and creative vein that needed to be struck in order for both acts to move on.